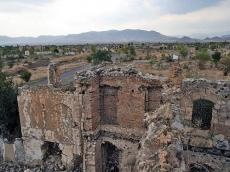 Armenian Prime Minister Nikol Pashinyan is not able to really resolve the Armenian-Azerbaijani Nagorno-Karabakh conflict. Soon it will turn a year he took power into his own hands, but nothing has been done during this time to resolve this conflict, which continues to poison the lives of Azerbaijanis and Armenians. Pashinyan is not ready for Nagorno-Karabakh conflict negotiations, because his power in Yerevan has not yet been strengthened, said Head of the Baku International Policy and Security Network Expert Group, expert on security and international issues, Professor Elkhan Alasgarov. Despite the fact that Nikol Pashinyan came to power in Armenia through demonstrations and even gained a majority in parliament after the last elections, there are opposition forces that oppose him with the help of financial and military resources, he said. Alasgarov added that those who do this are mostly members of the "Karabakh clan". "The soldiers in the occupied Azerbaijani territories and the so-called separatist-political structure began a secret war with Pashinyan’s team. Their main argument and objections are Pashinyan’s meetings with Azerbaijani President Ilham Aliyev on the Nagorno-Karabakh problem settlement," said Alasgarov. Even the resumption of the negotiation process has created some trust, he added. Many people in Armenia do not like direct bilateral meetings, and the campaign against Pashinyan in Armenia started. “There is no official statement of the Azerbaijani and Armenian sides on the negotiations content after the Davos meeting” said Pashinyan during his visit to Germany. This statement underlines that he is trying to overcome opposition’s criticism, trying to show the Armenians of Nagorno-Karabakh as a separate side of the conflict," he said. Alasgarov noticed that at the same time, other forces interested in this issue should be taken into account. “There are third countries that do not want the conflict to be resolved. Some forces oppose changing the status quo in the Nagorno-Karabakh conflict. Although these forces are not open, they secretly use media to campaign against Pashinyan,“ he said. Pashinyan made several populist statements during his visit to Germany, stating that "the concessions of the Azerbaijani side are acceptable to the people of Nagorno-Karabakh and Armenia". It seems that Pashinyan has forgotton about occupation of Nagorno-Karabakh and seven adjacent regions by Armenian armed forces. And Armenia must comply with four UN resolutions which speak of the immediate withdrawal of Armenian troops from the occupied regions of Azerbaijan. Otherwise, it is impossible to explain this statement of Pashinyan, which reduces all negotiations to zero.